Larry Garner is a long time top level field dog trial competitor and rated judge. Join Angelea Kelly for tidbits about the Tennessee Walking Horse, as she talks with Upland Field Dog Trial competitor Larry Garner and learn how he first started using SpaldingFlyPredators.com, then flash back to HorseGirlTV Classic’s interview at The Chronicle Of The Horse in Middleburg, Virginia. Thanks to the amazing easy to use biological fly control company, SpaldingFlyPredators.com! We’ve been using them at the farm since 2012 and they really work. No flies! Angelea – I’m Angelea Kelly and you’re watching HorseGirlTV, and we have a great show for you today. We are going to start off with a little bit HorseGirl mail. So Stephanie from Boulder, Colorado, asked “I heard the Tennessee Walking Horse wasn’t named after the state, so where did it come from?” Well Stephanie, thanks for your question, and just to give you a little backstory you might already know that the Tennessee Walking Horse – or the Tennessee Walker – is a gated horse; it’s known for its flat-footed, four beat running-walk. It’s not from the state of Tennessee per se, but the breed was developed in the southern US. 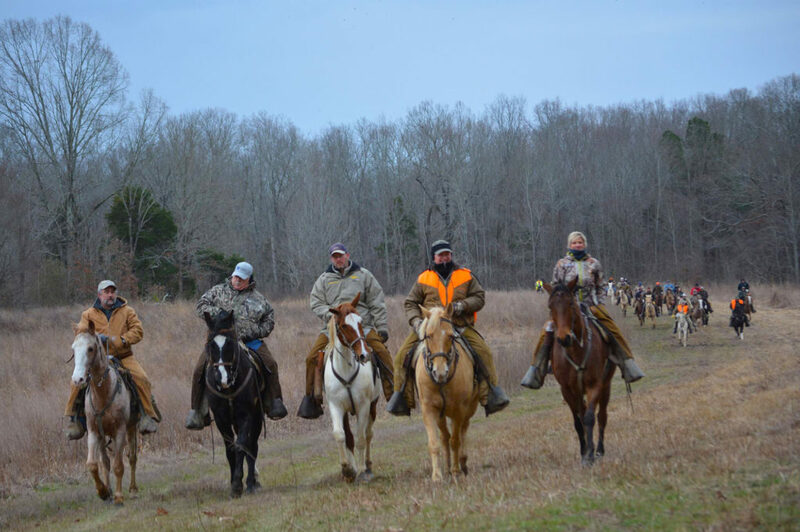 it’s running walk is super comfortable, so plantation owners and farm owners back in the day who spent hours and hours in the saddle bred that running-walk into them to help them enjoy a ride as they surveyed vast amounts of their land. So today, it’s a competition horse. but it’s also still a pleasure horse, and as you will note from today’s episode I hope it’s also used in field dog trials. So thanks again Stephanie, and we will be sending you a very cool HorseGirlTV mouse pad for your question. Remember to send your questions to mail at horsegirltv.com, and you too can be featured on the future episode. Today we are talking with the infamous Larry Garner. Larry’s down in the grand state of Texas, so he’s coming to us remotely. Larry, thanks for coming on the show. Larry – Glad to be here Angelea. Angelea – So Larry, you and I met back in maybe 2011, 2012, and you were working with the Spalding crew. How long have you been with those guys, and how did you get first involved with the fly predators? Larry – Well, I got involved with fly predators back in 1997; my wife and I were on a small acreage in Oklahoma, and I told her I was sick of having flies, and I’d read an article in a western horseman magazine about these little bugs and I thought I’d get me some. She said “you’re kind of a sucker for anything”, I said “Heck, I’m tired of flies”, and she said “I am too”. So about three months later, she said “whatever you’re doing for those flies you just keep doing it.” So for the last twenty years I’ve ordered fly predators every year, and I don’t have any flies in my place. I semi-retired back in 2005 from a company I was running for an international group, I was running a North American puppy food [company]. Yeah, being bored of being retired, Tom Spaulding asked me to go to a few horse events and represent his company, and I thought “gosh, that’d be fun.” So since 2005 I’ve been going to horse events and talking to people about fly predators, which is pretty easy to do because it’s a great product and it’s a great company. Angelea – Right on. And now as a horseman, you’ve had a lifetime with horses from all different disciplines, but in the last – I don’t know how many years – you’ve been a really successful field trial competitor. Could you tell me what field trials is, for those of us that don’t know? Larry – Bird dog field trials are a sport where you send an upland game bird dog in the field in pursuit of other game – quail, pheasant, whatever – and we chase them on horses. Basically we don’t chase them, we follow; I tell people it’s kind of like fox hunting on a horse. We don’t shoot the birds, we actually compete, and when we compete what we’re trying to do is to locate the birds, to find them to show the judges that our dogs are mannerly and they’re according to the game, and then we go on to the next one. Typically, we do this in large spaces outdoors, we ride about six hours a day, and we show the dogs one hour at a time. Angelea – Okay, so you essentially bird follow like fox chasing; the birds don’t die and the dogs follow them for you and you guys follow the dogs? Larry – That’s correct. We send the dogs upfield, and then we follow them on horseback. When they locate birds, they stop collectively, we get off, flush the birds shoot a blank gun to simulate the hunting, and then we go on to the next one. Angelea – You, now you ride… for this I’m guessing you said you’re on a horse of six hours a day, so you need an extremely comfortable gate. And you ride a Tennessee Walker, no? Larry – That’s correct. Typically, we ride Tennessee Walkers because of the pace at which we go. You can ride other horses and you will certainly be okay, but you would be posting the trot. When we’re riding a Tennessee Walking Horse, we’re going at a running-walk, or a flat foot walk, so just the pace is comfortable. Angelea – You’ve been doing this for some time, you’re quite good at it from what I understand, and you excel at a certain level, and then you’re asked to be a judge. So you are a judge now, what is that like? Larry – Well, you’re exactly right. When you become a good competitor and people recognize that you have the ability to train and compete and know what you’re looking for in a dog and you’re successful in winning, then you get asked to judge at a club level. And then based upon your success at club levels, you’re asked to judge at higher levels. I’ve been fortunate enough to be asked to judge the National Shooting Dog Championship. I’ve been doing [coughs] excuse me, I’ve judged the National Shooting Dog invitational twice, which is quite an honor it’s the top competitors in America, and I’ve judged some very important championships. But primarily I’m a competitor, our breed dogs have raised a bunch of champion dogs, and it’s just something that I pursue and I love it because it’s palatable. Angelea – And so you’re more of a competitor, but has the judging helped your riding as a competitor, to become more keen with the following and any aspects? Larry – Well you know like judging anyone else, when you get an opportunity to look at other people, you get a little bit better window on what you’re doing. You get less kennel blind is what we call it; when you only look at your own kennel, you think they’re all wonderful but when you see the next man’s kennel, he may have a better dog than you do. So judging raises the standard of your competitiveness because you see good dogs from across the country. Angelea – Now if somebody wanted to get involved in this, because this actually sounds really cool to me it sounds fun just to hang out with a bunch of folks and be outside in nature for six hours on a really comfortable gate, how could somebody get involved with field dog trials? Larry – Well amateurs in America compete under the sanction of the American Field Trial Association, it’s called the AFTA, and they have amateur trials across the country from, you know it starts in the fall and goes to the spring, we don’t compete much in the summer just because of the hot weather. But they’re trials all across the country in various breeds. I primarily compete in the quarter setter trials, but there are Brittany Spaniel trials, there [can’t understand] trials, there are [can’t understand] trials, there are red setter trials, there’s a lot of different trials for different types of dogs. And they’re everywhere from amateur stakes to professionals who do this for a living that run in open stakes, where you can sponsor a dog and be an owner if you choose. Angelea – Why did the horse cross the road? Angelea – Because somebody yelled “hey”! Alright, you can do better than that? Larry – Alright, this is the Texas dog joke… you heard about the dog that limped into the bar on three legs? Larry – He said “I’m looking for the skunk that shot my paw”! Angelea – [ba-dum-tsss] that’s better than my bad joke. [laughs] Well, I’ll let you get out of here Larry, thank you so much for taking the time to come on the show, and it’s always a pleasure to talk to you, and thanks for letting us know some really cool stuff about field trials. Larry – Great see ya. So I have these flashback episodes I want to share with you guys, and I’m dubbing them HorseGirlTV classics. So in this personal flashback, I travel to Virginia to interview the then editor of The Chronicle of the Horse, Robert Banner, and Robert and I talked about point-to- points and fox hunting, and I hope you will notice the similarities between that and our episode today with field dog trials. Robert – That’s peppermint, we’re very dog-friendly here. Angelea – So Robert I want to thank you for being on the show today. Robert – You’re welcome Angelea, I’m honored. Angelea – I’m honored to be here! I guess let’s just start off with the Chronicle of the Horse, it was started in 1937 is that correct? Robert – That’s correct. It was started by Gary Webb and Stacey Lloyd, who thought that this would afford their fox hunting and point-to-pointing pleasures, and so they started the Middleburg Chronicle. The Chronicle from 1937 has always been to disseminate news and information about better riding as it pertains to sport of horse activity. And in the early days, the magazine was used as a platform to start the US Dressage Federation, the US. Eventing Association, the US Pony Clubs, God’s to the North American riding for the handicapped I think. Alexander McKay Smith was then the editor and was the one who brought all of this to the pages of the magazine and helped found those organizations, which of course for the national governing body today. Angelea – What has been the most significant advancement in the magazine since its invention? Robert – I’d have to say that the race to the digital age has got to be it. We started our website 10 years ago, chronofhorse.com, so that we can bring the news that we bring in print to our subscribers or to the people who would like to read it electronically. Angelea – You guys have an amazing forum, I use it myself actually. Robert – Oh the bulletin? Angelea – Yeah, the bulletin board. Robert – That place is off the hook, it’s crazy! Yeah, it’s a great place to go for free to ask questions to people that are more experienced, and I think it’s become a lightning rod for anybody who’s looking to learn to do better what they do in sport horse activities. But we’ve got so much more to do, and we will. Angelea – Well that that sort of brings us into this whole North American point-to-point association. Now you’re the current president, is that true? Robert – That’s right. It’s kind of a pet project of mine, although it was founded by George Strawbridge and Mason Lantern. It was formed as a way reconnect to fox hunting, to bring people that are learning to ride via fox hunting back into a more competitive discipline, and that being steeplechasing. One of the things you learn when you’re out fox hunting is how to judge jumps by your eye. You don’t have time to go out and walk that course, to step it out, you have to ride that. And the way to do it is to feel it, to know it, to live it, and to have done it fox hunting; then you have that that direct connection with the next jump ahead of you. Michael Plumb and Bruce Davidson, event riders extraordinaire, will tell you that they learn to do their disciplined by fox hunting and running in point-to-points. Angelea – So what are you going to do to bring maybe more amateurs or young riders into this sort of fold? Angelea – Well Mason and George are pretty smart guys, they started and invented field master chases. Now. field masters chase operates much like a fox hunt does. All of the riders and follow behind a field master, and if you pass the field master than you’re disqualified, it’s similar to fox hunting. And then you learn to jump in company, with other horses and riders beside you, and you have to rate your horse because you don’t want to pass that field master, and then after the last jump the field master peels off and you get to get it to the wire, and that’s where the speed comes in and that’s where you really start to enjoy the sport. Angelea – So I if I had a horse, I could get involved on some level and learn some of the basics? Robert – Of course, absolutely. More fun than you’ll ever have. Robert – Well I do remember my first start and there was no North American Point-to-Point Association, and there was no education; but I had a serious fox hunting background, I had a real nice horse that was bred on our farm, and out of a nothing stallion and a nothing mare, but it came out to be a something horse. And everybody told me “Are you going to steeplechase him? he’s good, you ride him really well.” “Well, I don’t know, I never have tried that.” They said, “Well there’s a point-to-point coming up, and this is in Tennessee where there’s not a lot of steeplechasing activity, but I remember tacking the horse up in the paddock and my friend, Michael Berryman, was leading him, and he said “Okay, now you’ve schooled your horse, right?” And I’m like, “school my horse?” Now I’m in the [can’t understand] and he’s leaving, and we’re going to the start I’m thinking “Oh my god, did I miss something?” And he’s like, “you didn’t school your horse?” and he was giving me the education as we’re going down to the first jump. He’s like, “okay use that natural eye.” I’d grown up with Mike, and he knew I could handle at least that. Everything went really really well, and I ended up second in the race. Robert – First time out, yeah. And from then on I guess I’ve made over 30 starts, but God, the feeling of speed, the adrenaline, there’s nothing like it, it really is that cool. But it’s all wrapped around fox hunting, and I can’t encourage your viewers to enjoy fox hunting more; there really is a place for just about everybody out there, and if you really want to do it, you should try. Nothing is more exciting – except steeplechasing – than running across an open route of ground, and hills, and valleys, and open fields, and jumping from a coupe in a field into the woods, serpentining through the woods and coming out across the ditch and across the road, and jumping a coupe and into the next field, and cantering on, it’s lot of fun. Angelea – I think I’d even get an adrenaline rush from hilltopping. Robert – I know you would. Just being outdoors, being out of the arena and enjoying the open space is the way to live. Robert – That’s a good question, but luckily Jessica is in a really good place, because the Toronto area is just known for the number of experienced horsemen in every discipline. But what she should do is to try and find a trainer who is able to take her to the shows that she needs to go to, but I can’t recommend any more highly going to the fox hunting community in that area and learning to ride over an open route of ground, because that’ll give her the balance that she needs to be attractive to those show jumper trainers. They’ll know that she knows how to ride, especially the hunting community there, I think they enjoy a huge amount of support and success. So she’s in a really good spot to do what she wants to do.